What can be said of a Gadol who was so much a part of this world, yet so distant from it? A man whose innovations in teaching Torah, through tapes and telephone and technology, were twenty years ahead of his time; yet his personal lifestyle resembled that of generations past. How did the man who declared his unwavering emunah with his every word; imparted the language of the Chovos Halevavos in his every nuance; incorporated the words of Tanach into his very vernacular, become the eloquent spokesman who inspired hundreds and thousands of souls, tainted by the heresy of a yoke-casting nation, many of whom never even picked up a Chumash before hearing him, return to Yiddishkeit? How did the man whose outlook on life made him sound as if he was a Rosh Yeshiva who had never seen the shores of the United States find the right expressions and the gentle wit to pierce the sullied barrier of America's frivolities, and reach the souls of thousands? How does the tzaddik who slept for sixty years on a sheet-covered board, and ate a raw egg and half a sugar cube for supper, impart a love for Torah to the American kids who lived from one ice cream cone to the next? How could the man who the Satmar Rebbe labeled as "not from this dor (generation) but rather from a previous generation,” bridge the gap to become a father to so many who needed a bridge to their father in heaven? How does the Rav who was immersed in the depth of Rav Isaac Sher's shiurim, who absorbed Rav Avraham Grodzinsky's mussar, and the brilliance of the Lithuanian Yeshiva, enable himself to spend an entire year learning HaMafkid with a retired milkman or to discuss yesodos emunah with throngs of Chassidim and Sepharadim and Yidden from all backgrounds? The answer must be very clear. The Torah and Mussar of that man, Rav Avigdor Miller, transcended any obstacle that would impede the imparting of the Ribono Shel Olam's words to anyone who was willing to hear. Emes pierces all barriers, and the clear vision he had of the Ribono Shel Olam forever standing in front of him, enabled Rabbi Miller to accomplish the task of thousands. He was a one-man institution; he was a central station of every facet of Torah; a flowing fountain, never ceasing to satiate thirsty souls and strengthening their desires to come back for more. He did more than make ba'alei teshuvah from the non-religious, he made ba'alei teshuvah, ba'alei hipa'alus, ba'alei machshava from the already-committed, imbuing a new sense of desire to grow in Torah, Mussar and Yiras Shamayim. Rav Avigdor Miller was born in Baltimore, Maryland on the second day of Elul in the year 1908, to Reb Yisrael and Hudda Reva Miller. His grandfather, Reb Dov HaKohen Miller was a very pious Jew; a shochet and a melamed, who fled the terrible persecutions and pogroms of White Russia four years earlier, together with his son and daughter-in-law. Reb Dov continued in his traditional role to serve the kehilla of Baltimore. His son, Reb Yisrael, followed in his ways. With great mesiras nefesh, he struggled to earn a living as a Shomer Shabbos grocer in Baltimore, ensuring that his sons Avigdor and Yeshaya would receive a proper Torah chinuch. Although there were no formal Yeshivas during his youth, as a child, Reb Avigdor went learn in a Talmud Torah under the tutelage of a Mr. Tarshish, who would teach him privately in addition to the hours spent in school. By the time of his Bar Mitzvah, young Avigdor was already proficient in Tanach and had a knowledge of Yiddishkeit far greater than most children his age. The words of Tanach became the staple of his language throughout his life. 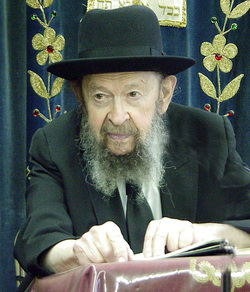 His brother, Rav Yeshaya Miller, a Rav in Boston for many years, told his son, Rav Yisrael Miller, Mara D'Asrah of Congregation Poalei Tzedek of Pittsburgh, PA, that by the time he was twelve years old, Avigdor had already ceased the normal playful activities for his age, and had immersed himself in serious learning. After his Bar Mitzvah, Avigdor had already decided that he would like to become a Rav. By the early 1920s, young Avigdor would spend his free time either learning with Reb Tarshish or sitting over a Gemarah in the Bais Knesses in Baltimore. For hours on end he would sit, undistracted and undisturbed, melding every bit of knowledge he received, whether from his mandatory secondary education or his learning, into the essence that would later influence the lives of thousands of Jews across the entire globe. By the time he graduated from high school he was not only a serious Talmid of Torah, but a master orator and earnest thinker. In those days, for the Yomim Noraim, shuls would be packed, filling over 1000 seats with Yidden whose heartstrings tugged at them to fully observe the chagim. However, the Rav would usually speak in Yiddish, and unfortunately, there were already hundreds of American-born congregants who were not proficient in the illustrious tongue of their forebears. For them, there would be an additional speech in English, in order that they, too, could get a feeling for the awe and aura of the Y'mei HaDin. The question obviously was, who, in 1925, would both be proficient enough in the English Language to speak eloquently, yet be imbued with a high level of Yiras Shamayim and be able to impart the Aimas Hayom, creating an impact on the vast audience? Young Avigdor was chosen. Though only 17 years old, he delivered a stirring English language Kol Nidrei drasha to an audience of more than 1000 people! It was only the first case of a life-long career of powerful oratory that would address the challenges and shape the future of the American Jewish community. That Elul, he left to learn in New York’s Lower East Side, under Rav Moshe Soleveitchik in Yeshivas Rabbeinu Yitzchok Elchonon. He became close to a group of chaveirim who would be omaid al hamishmar throughout their entire lives as generals in the milchamato shel Torah on these shores. Among them were Rav Nosson Wachtfogel, Rav Yehuda Davis, Rav Mordechai Gifter, and Rav Moshe Bick, zichronom livracha. He quickly became well liked at the Yeshiva and his leadership was immediately apparent. He was elected to head the student organization and became a spokesman for many of their views. Rav Miller was careful to use his secular knowledge only to be mashpia on others. His broad knowledge of science attached a higher value to the wonders of creation, and the Almighty's undisputable signature on every aspect of the natural world. His vast vocabulary and command of English was used to communicate Torah hashkafah to the less committed. In fact, when brilliant young refugees would enter the portals of the Yeshiva, Rabbi Miller was asked to tutor them in the English language. Rav Moshe Soleveitchik asked him to tutor his own son, Ahron. Wisely, Rav Miller carefully chose the most boring volumes as study texts. He did not want his younger charges to be influenced by the tainted outlooks of many authors. He once mused with a family member that he could find nothing more boring and uninspiring as the first ten chapters of Ivanhoe, and so that is what he used to teach them. When the administration of RIETS wanted to introduce a secular college as part of the Yeshiva, even though he, himself, was attending classes at CCNY, Rabbi Miller, along with his chaveirim, vehemently protested the introduction of the synthesis of secular studies in the same edifice and institution that had formerly exclusively taught Torah. Within the Yeshiva, itself, Rav Miller strove to elevate the students in a way that would guard them from the prevailing notions of American society in the 1930's. He arranged for the citadel of kanaus and Yiras Shamayim, Rav Yaakov Yoseph Herman, known to today's generation of American students as "All for the Boss," to give clandestine shmuessen and shiurim in Mesilas Yeshorim at night. The administration of the Yeshiva was not enthused with the fact that an outsider was delivering lectures to the students, but perhaps even less so with Rav Herman’s kana'us and intonations that there were places that could offer greater growth in Torah than what could be found in America-- the world of the European Yeshiva. Rav Miller thought differently, and resolved to grab at the chance of teaching children whenever it would arise. The Talmud Torah in his home town of Baltimore was looking for a teacher, and Rabbi Miller decided that it would be a perfect opportunity for him to pursue a career in chinuch. He called his Rav in Baltimore, who tried to strongly dissuade him. "Reb Avigdor, you can go on to much greater things! If you come, I have no choice but to give you the job, but," he continued, "I am advising you to continue learning in Yeshiva." Rabbi Miller was not moved. On the Sunday meant for interviews, he got on a train and headed for Baltimore. He planned to arrive in the afternoon, but the train stopped in Philadelphia at one o'clock and, for no apparent reason, sat in the station for four hours. He arrived in Baltimore that night and rushed to the shul. His Rav told him, “I saw you did not come, so I hired someone else.” Rabbi Miller was so dejected, that he did not even visit his parents-- he just went straight back to the Yeshiva! "Oy!" Rav Miller used to exclaim, declaring the hashgacha Elyona of the train's breakdown. "Look at my dejection at the time! But now we know Hashem's plan. [Had I been hired] I would have remained in Baltimore and never seen the majestic Torah world of Slabodka!" Rav Miller's foremost encounter with that majestic world came in 1932 when the Slabodka Rosh Yeshiva, Hagaon Rav Isaac Sher, arrived in the United States, to raise funds for his Yeshiva. Every week, during Rav Sher's visit, together with a group of his chaveirim, 24-year-old Reb Avigdor would visit Rav Sher's apartment on Henry Street on the Lower East Side to hear a shmuess from Rav Sher. By that time, the depression had set in and the fundraisng mission proved to be a disaster. After the last shmuess before Rav Sher was to return to Europe, he invited the group to join his Yeshiva. The chevra were so captivated by the shmuessen that they decided to go back with the Rosh Yeshiva to Slabodka.. Rav Miller recounted the enthusiasm of Rav Yehuda Davis, zt"l, who later established a yeshiva in Mountaindale, New York, to encourage everyone to leave Yeshiva University and learn in Slabodka. Rav Sher tried to convince, Rav Gifter, whose uncle was an alumnus of Telshe, to learn in Slabodka, too. Rav Gifter journeyed with Rav Miller to Europe, and decided to spend his first Shabbos in Slabodka. However, he opted to go to the Telshe Yeshiva, convinced that the mussar of Slabodka was not his style. Years later, Rav Gifter mused, how he, who had not appreciated mussar in his original voyage to Telshe, would later don a special jacket to hear the shmuessen of his Rabbeim. Rav Mordechai Gifter remained very close to Rav Miller, attending his wedding in Nayshtatd. His son Reb Eliezer Miller said, that whenever Rav Mordechai Gifter would meet him, he would literally take hold of him and declare, "the z'chus of all my learning is due to your father!" Rav Isaac Sher would say, referring to the talmidim who returned with him, "I did not manage to bring back money from America, instead I brought back diamonds." Perhaps it is apparent that his mission was truly successful. The dollars he brought back, and invested in the facilities, suffered a blistered fate, while the diamonds return to illuminate and sparkle for a new generation of Torah in this country. Rabbi Miller arrived in Slabodka on Erev Shavuos, 1933. He was embraced by the Mashgiach, Rav Avraham Grodzinsky, who kissed him, declaring, "You have arrived for kabalas HaTorah!" In Slabodka, Rav Miller was introduced to a new world. Within the dilapidated facilities, there was a prolific spirit. Each bochur was a lamdan, their sense of respect for the hanhallah was profound. The overall aura was infused with a sense of overwhelming spirituality, and clear direction. Rav Miller soon became renown for his great hasmada. He learned in abject poverty, barely eating meals; splitting a sugar cube in half to sustain himself mornings and evenings. He slept on a board and wore through the elbows of the suit jackets and shirts that he brought from America. They became threadbare from the sway of material against the wooden shtenders. His meager sartorial extremities embarrassed him. He thought, perhaps, that it would diminish the view of Gadlus HaAdom, so he would not walk into the Bais Medrash in full view of his chaveirim, instead, he would be the first one in and the last one out, avoiding stares from the other charges. With great toil he continued his relentless mission al HaTorah v'al HaAvoda. When he made trips to the American consulate for matters relating to his status in a foreign country, he would have to borrow a suit, as his was ragged from wear, but with his charming personality, he made friends with the consular, a Baltimorean, like himself. This relationship proved beneficial when trying to help others get entry visas into the US. Rav Miller continued his close relationship with Rav Isaac Sher and considered him as his rebbe. He always marveled how every word was weighed and measured, and at his extreme dignity, composure, and restraint. "Everything he said ,you could understand, it was well explained with complete clarity.” In one of his seforim he terms his rebbe as "the clear thinker," an attribute Rav Miller himself would be later known for throughout his unrelenting career as a total mechanech. Rabbi Shmuel Shapiro, one of his Ba'alei Batim in Flatbush, who journeyed through the entire Shas with Rav Miller, beginning his first line of Gemara with him more than 33 years ago, talks about Rav Miller's appreciation and commitment to clarity. "Rav Miller would often say something and then ask us to repeat it. If we could not, he would say, the reason you cannot repeat it is only because I was unclear. I did not do a good enough job in explaining it. And so, Rav Miller would repeat the sevorah or explanation again and again until his Talmidim would be able to repeat it. He devoted himself to the unequivocal mussar of Rav Avraham Grodzinsky, and strove to attain the middas haEmes, an attribute that would hallmark his legendary directness and straightforwardness, leading Rav Moshe Feinstein to label him as the "Ish Emes of America." He was wont to say that the shiurim of Rav Isaac Sher were not as famous as those of the other Roshei Yeshiva. Though Rav Isaac could have said great and brilliant pilpulim, he traded his capacity of brilliance for the relentless search for emes. His attachment to mussar was not merely in theory; it manifested itself in every aspect of his life. Every step he took, became a journey that explored the greatness of the Almighty. His vision of the Ribono Shel Olam's pervading presence in everything from the massive sun, to the intricate complexities of the tiny apple seed did not escape his mussar-enhanced eyes. His quest for greatness led Rav Miller to master the entire K’tzos and Nesivos and Shev Shma'atsah by heart, and he would constantly review those volumes, even until the week before his petirah. On the 4th day of Sivan, in the year 1935, Rav Avigdor Miller married, Ettil, the oldest daughter of Rav Yaakov Moshe Lessin, zt"l, the Rav of Naishtat, Lithuania who also served as a menahel of the Kovno Kollel in Slabodka. His American chaveirim, joined Rav Miller at the home of Rav Levitan, for the wedding. Rav Miller learned in the Kovno Kollel, and developing strong relationships with Gedolei Torah in Europe. He would spends summers in Tzitivyan, talking for hours with the Tzitivyaner Rav, Rav Yaakov Kamenetzky zt"l, whose son, Rav Binyomin, of Long Island, recalls Rav Miller attending his bar-mitzvah. Rav Lessin had previously been to America with a delegation that came in 1924, which later helped save some of his family from the Holocaust. With the ominous storm clouds of anti-Semitism looming over the horizon, Rav Avigdor also knew that he and his family would have to leave Europe as well. Together with their son Eliezer, and their daughter, Shaynee, they traveled to America, back to Baltimore, Maryland. When a position was offered in Chelsea, Massachusetts in the prestigious Agudas Achim shul on Walnut Street, Rabbi Miller decided to accept. He knew that he would face a tremendous challenge raising his family in that community and helping to develop the congregants into B'nai Torah, but he was up to the challenge. Chelsea had very little formal Torah schooling for its youth. Except for the traditional Talmud Torah, there was nothing to enhance the public school education that the children received. Together with his father-in-law, Rav Yaakov Moshe Lessin, who had arrived in America in 1939 and assumed a position as the Rav of Dorchester, Rav Miller established an intensive after school program. Rav Miller served as Rosh Yeshiva while his brother-in-law, Rav Yisroel Meir Lessin, who had arrived from Switzerland, gave additional classes. Many community members greeted the new institution with consternation if not open rejection. They did not see the shortcomings of the official, yet feeble, education afforded through the synagogue's Talmud Torah. In addition, they understood that a true Yeshiva would cost money, and they did not want to be encumbered with additional expenses for Yiddishkeit. Rav Avigdor named the Yeshiva Ohr Yisrael after Rav Yisrael Salanter and began teaching the boys Gemarah and mussar on a level that small town America had never seen. Rav Miller did not compromise on his principles nor moderate his clear and unwavering shitas Hachaim for them. He told his nephew, Reb Yisrael Miller, "There was no difference between the shiurim or shmuessen that I gave in Chelsea and those that I gave in Chaim Berlin!" Meanwhile, the war in Europe was raging and Rav Miller was a constant source of encouragement to Jewish soldiers and servicemen who were sent overseas to fight the battle against the Nazi monster and its Japanese cohorts. Agudas Yisrael, published a magazine with a column, "Those that fight, write!' Often included in the letters were comments made by servicemen sent to distant locations, whose only kesher to Judaism were the words of encouragement given to them by Rav Miller. Back in Chelsea, the boys began to gravitate toward mesikas HaTorah, the consternation of the Ba’alei Batim grew. They told Rav Miller to shut down the school, threatening to fire him if he would not. Rav Miller consulted with his esteemed father-in-law. It is “Yeyhoraig V'al Ya'avor!” exclaimed Rav Lessin. "The Yeshiva will remain opened!" And it did. In fact, the boys grew in learning and their desire to continue on to Yeshiva Gedolah intensified. For summer vacation, Rav Miller would send them to the new summer camps in the Catskills that were administered and directed by b'nai Torah. Those who remained home for the summer, continued to learn with the Rav, in an informal setting on the lawn of his home in Chelsea. As the Talmidim grew in Torah and Yiras Shamayim, Rav Miller took it upon himself to personally accompany them to Yeshiva Mesivta Rabbeinu Chaim Berlin, to learn under the tutelage of Rav Hutner, zt”l. Rav Hutner was amazed at the grasp and breadth of knowledge that these young charges had, and the fluency in which they expressed their knowledge. He was particularly astonished when Avraham Kramer, related a difficult K'tzos Hachoshen, fluently, in Yiddish! There was one particular Talmid of whom Rav Miller would say, he is our ticket to Olam HaBah. He emerged as a leader in the Chelsea community and eventually assumed the leadership of the Yeshiva after Rav Millers' departure to New York. Here is the amazing story: Rav Miller had made a public plea for parents to send their children to the Yeshiva. He offered to learn with any child no matter what level he was on. All the child needed to join the Yeshiva was the desire to learn Torah. After the class, an elderly woman, approached him, saying, "My child would like to learn in your Yeshiva, do you think you could allow him?" "Certainly," responded the 34-year-old Rav, not realizing whom he had just accepted into the Yeshiva. "I'd love to meet him." A few moments later the woman came back with a middle-aged gentleman. He was surely a few years older than the young Rav. He was wearing a blood stained apron, his thick fingers, and broad arms testifying to his occupation as a very adept butcher. "This is my son," she exclaimed, "I am delighted that you will learn with him!" The gentleman had a rudimentary knowledge of the Hebrew language and, true to his commitment, Rav Miller, began learning with him. They went through the entire Chumash, soon they went through Mishnayos and Gemarah. In a short while, Mr. Kaufman became a loyal Talmid of Rav Miller and a leader in the community. The Yeshiva continued to grow, with an enrollment of 51 Talmidim, a staggering number in those days. But the yeshiva only educated older boys, and Rav Miller became quite torn. While the Millers daughter Shaynee was enrolled in the public school, he refused to send his son, Eliezer into that environment. The Chelsea School District granted permission for the Millers to home-school Eliezer, the only child out of 13,000 in the school district to be afforded that permission. But the gnawing problem of proper Torah education was foremost on their mind. Meanwhile, Rav Miller decided to purchase a separate building to house the Yeshiva. The move was controversial; but in the end, the community united. They were going to have a Yeshiva building. Rav Miller decided to ask Rav Hutner to address the community at the chanukas habayis, but before he got a chance to call Rav Hutner, something amazing happened-- Rav Hutner called him! He offered him a position as the Mashgiach of Yeshiva Mesivta Rabbeinu Chaim Berlin. Rav Miller thought of the opportunity he had. Years later, he told his children that he does not remember whether it took ten or twenty seconds to accept. The day after the chanukas habayis he broke the news to the kehilla. They were devastated, but his Brother-in-law, Rav Lessin, and Mr. Kaufman, took charge as Rav Miller packed his belongings and, together with his rebbetzin, who stood by his every act, moved to Brooklyn. With Rabbi Miller’s appointment as Mashgiach of Yeshiva Mesivta Rabbeinu Chaim Berlin, in 1944, he was faced with a demanding challenge. In those days, many boys who attended the Yeshiva were not attuned to a Torah lifestyle, and often came from homes that were barely Shomer Shabbos. Some were not ready for the serious program needed to produce true lomdim. Rabbi Miller’s goal was to instill a serious sense of responsibility and vision of greatness in the students, helping them to realize the potential each one had to grow in Torah. In addition to ensuring that the bochurim were learning, he was genuinely concerned with all aspects of their behavior. One zman, while the boys were learning Bava Kama, he noticed that some of the Gemaras that they were using were actually taken from various shuls in the community. When he found out that they were "borrowed" without permission, he refused to allow the boys to return, until each Gemara was returned to it's proper Bais HaKnesses. "How can one learn the laws of damages, while learning from a stolen Gemara?" He had to play the role of enforcer, maintaining the decorum and seder rooted in his very essence. He never let the image of Slabodka fade from his mind, nor did he lower his sights for the talmidim. His goal was to raise their level in mussar and while he worked to acheive that goal, Rabbi Miller continued his own learning with tremendous hasmadah, learning seven blatt a day, finishing Shas every year, reviewing ktzos and nesivos repeatedly, and teaching the sifrei mussar he was so fluent in. With the majestic presence and charismatic brilliance of Rav Hutner, at the helm of the yeshiva, Rav Miller nurtured the yeshiva’s sense of structure and order. Chaim Berlin grew to become a central force in Torah education for serious lomdim, producing hundreds of b’nai Torah who grew to be leaders in both the lay world, and in the world of chinuch and Torah education. He was mechazek the second seder in the Yeshiva, and raised their consciousness about their search for greatness. According to many Talmidim, Rav Miller served as a policeman, guarding the kovod of the institution, the Rosh Yeshiva and the hanhalla. His demeanor never was ruffled. With gentle humor and sometimes-caustic wit, he deflected negativity and afforded mussar. It is well known how he would approach a group of young men surrounding a table, worthless banter flowing between them; Rav Miller’s stately form, flowing frock, and perfect diction would startle their idleness, "What will it be this morning, Gentlemen," he would begin. "Would you prefer a scotch or rye?" Realizing that they were behaving no better than boys in a bar, they would scurry to begin their limudim with a sense of seriousness. Even the Rabbeim, were affected by his sense of seder. One brilliant Maggid shiur would often lose his way on the subway, sometimes showing up hours late for a shiur. The boys were in a state of limbo, not able to learn properly in anticipation of his imminent arrival. Rav Miller was insistent that he be more responsible, and would even cancel the shiur if it had to begin late! His sense of humor could always put a gentle touch on a very serious topic. Once a boy walked into seder late. "Why are you late?" asked the Mashgiach. "I became a chasson last night," exclaimed the student. Rav Miller gave his bracha and tochachah in the same breath. "Mazel Tov! Make sure that never happens again!" he smiled. His devotion to perfect seder hardly allowed him to tolerate tardiness. His Seder Hayom was punctual and unwavering. The storekeepers on Pitkin Avenue, set their watches to his comings and goings. He was strict about tardiness, but always with a sense of humor. During the Korean War, he would chide the late comers, “It's either 9:30 in the Bais Medrash or 6:30 in the morning at Fort Dix!" Two years after arriving in New York, he took a position at the Young Israel of Rugby. Orthodoxy in America was still at its budding stages, and Rabbi Miller had an arduous task of incorporating his non-compromising opinions and perspectives into a kehillah that was very satisfied with its level of Yiddishkeit. Many members left the shul. "It was the needle speech that did it for my family!" one member whose father left, told me. “Needle speech?” I asked. The man smiled. Those who remained, however, became more than mispallelim, they became Talmidim! In 1965, Yeshiva Chaim Berlin moved from Stone Avenue to an empty public school in Far Rockaway, NY. The spacious building was a real bargain, but the bussing of students and the traveling took a toll on Rabbi Miller. Though Far Rockaway was a burgeoning suburb that would see tremendous growth just a decade later, it had not yet reached a level where it could support the Yeshiva financially, with only local boys comprising the bulk of the Yeshiva’s enrollment. Eventually, Rav Miller decided to leave the Yeshiva and immerse himself into full time Rabbanus. He endeared himself to his Ba’alei Batim and concentrated on uplifting them and dreamed of making lomdim from them. He took a meager salary and was beholden to no one. He was not afraid to talk about the immorality of society in the strongest of terms. He did not sugar-coat his mussar by weakening his reprimand, but rather, injected humor into the reality of the problem. After discussing how vile and depraved heresy is, a student asked him, "Rebbe, I must read this stuff for a course I'm taking in college. What should I do?" Rabbi Miller, looked incredulously at him. "If you are thirsty do you drink from a latrine?" At first, his shiurim to the Ba'alei Batim were on easier topics-- Mishne, Chayai Odom and Ein Yaakov, but a visiting Gadol chastised him, saying that he could teach his Ba'alei Batim "Gantz Shas." Like always, Rav Miller was a great mekabel, and he knew that if spoken by a Gadol BaTorah, those were not words, they were reality. And so, in 1967, he embarked on a mission that would leave an eternal impact on hundreds of families across the world. With a group of fifteen or so congregants seated around a table, he began with the words, "Shanyim Ochazim B'Talis." To some members of the class, it was as foreign as an ancient language. He had them write down the words. He had them fill in the nekudos. And he had them repeat it. He taught them with the same enthusiasm that a young haschalas gemara rebbe displays towards his Talmidim. And they responded in kind! Nothing was above them; they followed their rebbe's charge, unabashed, unashamed. Repeat after me! "Shanyim Ochazim B'Talis!" And so it went. One of the important skills he would stress was having the students understand the "idiom of the Gemara." After one year the group grew in size and in greatness. It took a year, but they finished three blatt Gemara-- and they knew it cold! The next year's project was more than three blatt. It was an entire Mesechta! Night after night they came. They reviewed and they repeated. At the end of a year they finished Gittin! And then they would make an appointment to come to the Rav's home to take a farher! Everyone had to take a farher! If you knew a blatt by heart you received awards! A retired milkman began his journey in to the Gemara with Rav Miller at age 65. Three years later ,everyone in the shiur waited in anticipation for the outcome of his "farher." He returned ecstatic! The Rav took out a bottle of schnapps, something that was very rare for Rav Miller, and made a L'Chaim! Such a simcha is truly worthy of a L'Chaim! Rabbi Shmuel Shapiro, who finished the entire shas with Rav Miller, and was bestowed with s'micha, related to me how he would pick up the phone to make the appointment and then would wipe his brow in relief, if no one would answer! It was another chance to review! Who today would have both the courage and the audacity to farher his Ba'alei Batim on his shiurim? But Rav Miller who only knew the emes and feared no one, did what a rebbe should do. It did not make a difference if the student was a child or the President of the shul! "His enthusiasm and constancy was a source of chizuk for those who attended his shiurim on a continuous basis. Sometimes we would encounter complex issues, but Rav Miller's clarity, and his ability to pepper the most complex and even seemingly boring sugyos with additional Agad'ta Gemaros lifted our spirits and held our hands." The genius of the potpourri of shiurim in well over a dozen different mesechtos, encompassing some of the most difficult sugyos in Shas, is unimaginable. He wanted to assure his Talmidim that if their inability to come every single night would not impede their ability to hear a shiur with relentless continuity. And so, for every day of the week, for every seder in shas, for every intellect and on every aspect of hashkafa-- there was a shiur! On Thursday evenings he gave a hashkafa shiur at the Sefardic Institute. That shiur went on for years and years. It was disseminated by tape throughout the world, his penetrating wisdom reaching all types of Jews in every corner of the world. The assortment of Yidden who would flock to hear the shiur was indescribable. Chassidim, Misnagdim, Sepharadim, Ashkenazim, Black Hats, Kippot Serugot, aged people in wheelchairs, and high school students and their parents! He spoke what was on his mind. He expressed his unadulterated opinions and did not hesitate to forever speak the truth. And Emes is what drew them. He said to a grandchild that much of his hashkafa of history came from the Zichron Yaakov, written by the secretary of Rav Yitzchak Elchonon Spector, the Kovno Rav. He, in fact wanted to translate it and met with Rav Yaakov Lipschutz's grandson Rav Binyomin, of Fall River, Massachusetts, for permission. Ardently against secularism, Zionism and other movements against the Torah, Rav Miller did not hesitate to speak out against the leaders of idealists that he felt went contrary to the Torah’s against the Torah. He spoke out against the invasion of immorality into our homes, painting a clear picture about the evils of television, encouraging everyone to smash their sets! "It is like having a sewer draining into your living room!" he cried. He would support political candidates whose views would promote morality, openly denouncing their liberal opponents. He acted vehemently to even a subtle hint of impropriety in hashkafa. Reb Moshe Kolodny recalls himself as a student in Chaim Berlin telling the Mashgiach that the Yeshiva received a new set Mishnayos. 'Bring me Mesechtas Sanhedrin," Rabbi Miller said. When the bochur brought the Mishnayos, he flipped to the back where the Tiferes Yisrael had a section, answering evolution according to the Torah. Instead of denouncing the theory as malarkey, the piece contained some defenses of the theory and tried to answer it according to a Torah perspective. You see this. It is totally unnecessary and inaccurate. The Navi Yeshaya (51:13) declares, "You are terrified continually, because of the "chamas hamatzik, ..v'ayeh chamas hamatzik -- the oppressors fury.” But where is the oppressors fury?" Everyone is afraid of evolution! It is a lie and a joke! Where is the fear? Rip it out!" The boy stammered, “R..r..r.ip it out? Rebbe, I can't rip a sefer.” "It borders on heresy, and it's a mitzvah to get rid of it!” With that Rav Miller, removed the section from the Mishnayos and declared, "Ubiartah Harah Mikirbecha! Rabbi Miller's impact on younger charges was profound. After a strong talk, imploring everyone to smash their television sets, Rabbi Miller received a call from an irate taxi driver, "When I was driving my cab, my son came home and smashed the television! He said you told him to do it! Are you crazy??! " Rabbi Miller was cool, calm and collected. Is your son named David?" he asked. "Such an amazing fine boy!" Rabbi Miller went on to extol the child, and even more so, the parents that raised him. He was so impressed with their parenting that he asked to send others to their home to take lessons and receive advice! By the end of the conversation, Rabbi Miller had made friends with this man, who ultimately came into agreement with his son's actions! Rabbi Miller had the ability to inspire others to reach levels of Yiddishkeit they never thought they could. In the late 1950s, when Yeshiva South Shore, the first all boys Yeshiva of its kind, opened in Long Island, Rabbi Binyomin Kamenetzky, who had known Rabbi Miller in Europe, invited Rabbi Miller to speak to the kehilla to encourage the concept of a boy's Yeshiva! "You think you can run from the Torah by leaving Brooklyn and coming to Long Island?" he began! "You can't escape the Torah!” He went on to speak strong words of hashkafa and mussar to the kahal. The crowd was not used to a Rabbi taking such a powerful stand to convince them of the importance of separate education. Ultimately, the Yeshiva was established and became the forerunner to a myriad of separate boys and girls Yeshivos on Long Island and the Rockaways. In the 1970s, when the neighborhood in East Flatbush began to deteriorate, the level of evening shiur attendance began to diminish as well. Rabbi Miller instituted a Torah-by-phone study program, for those who were homebound; a forerunner to the Torah Phone arrangements that are now a household word in many communities. Rabbi Miller was a non-stop Marbitz Torah. His array of classes reads like a listing of volumes from among the largest libraries of seforim. His eclectic shiurim could satiate any soul on any level. Even proficient kollel members would sit side by side with the Ba'alei Batim who had recently entered the foray of Milchamato Shel Torah, absorbing Rabbi Miller’s lessons. The following is just a glimpse of a partial listing of the most recent array of Rabbi Miller’s classes. It is hard to imagine that years ago, the list was almost double in size! He used to give two shiurim each morning, but later switched to one shiur as he got older! A Sunday shiur in Gittin at 8:00 a.m. began the week for Rabbi Miller. It was followed by a learning breakfast and a shiur in Sanhedrin at 10:30. Monday mornings he would teach Nazir and Monday evenings he gave a shiur in the complex Mesechta Eiruvin. On Tuesday mornings, he taught Pesachim, and in the evenings he delved into the complexities of Mesechta Shevuos. Wednesday mornings he would give a shiur in Mesechta Shabbos and at night would teach Mesechta Kiddushin. On Thursdays he would give a shiur on a different Perek of Nazir, and on Friday Mornings he taught K'subos. In addition, he gave shiurim in the afternoon-- from the mussar of Chovos Halevavos to the complex simanim of Tur Even HaEzer. On Shabbos he would learn B'choros. Shabbos afternoons were reserved for his Agad’ta shiur –beginning with two lines of Gemara and expounding for an hour! He used to say: "The Gemara would make a one line quote with the preface of 'darash Rav,' Do you think Rav spoke only one line? He spoke for hours! The Gemara compressed it into one line, and our job is to reconstitute it!" But he did not stop with Gemara. Every day, before Mincha, he would give a shiur in either Chovos Halevavos, Mesilas Yeshorim or Orchos Tzadikim. In the winter, on Friday nights, we would learn Sha’ar Habechina in Chovos Halevavos, which discusses recognizing Hashem in every aspect of creation. Every year, over and over again. He would learn it and review it. One member said that he learned Sha’ar Habechina with him no less than forty times! On the hottest days of summer, when everyone would mutter about the heat, he would bask instead of sweat in the sunlight, thanking Hashem for that great source of light! He would constantly remind his talmidim, that despite all their machinations and study, they must never forget that they are in front of the Ribbono Shel Olam. A bochur who had been influenced by Rav Miller was transferring from public school to Yeshiva High School. Rabbi Miller called him. “Now that you are starting a career in a Yeshiva, I’d like to tell you something. In addition to the shiurim in the Bais Knesses, he became the Mashgiach in his son Reb Shmuel's Yeshiva, Bais Yisrael. There, he would give sichos in Yiddish, the language he cherished and used in his home and with his own children. Though he taught mostly in English, he maintained Yiddish for his family, recognizing its vital importance in the continuity of the Mesorah. He did not hesitate to encourage his Talmidim to use any technology to further their leaning experience. Rav Miller would often quote the Chofetz Chaim, "the technology of the steamship was invented in order to get the American bochurim across the sea to Yeshivos in Europe much faster than ever." He applied that theory to advance the use of tapes to teach Torah. When cassette recorders were introduced in the early 1970's, Rabbi Miller, with great vision, encouraged their use to record his shiurim, thus beginning the thousands upon thousands of shiurim that have since been recorded for posterity. His tapes are being heard by talmidim today who were not even alive during the original recordings! He even had the electrical wiring in the shul redone to accommodate the myriad recording devices. In fact, he was so grateful to Reb Pinchus Shelby for advising him and arranging the taping of the Thursday night hashkafa shiur, that he explicitly mentioned an expression of hakaras hatov to him in his tzava'ah. In every aspect of his shiurim he searched for emes. After he wrote his first book, Rejoice Oh Youth, he called one of the more cynical boys in Chaim Berlin and presented him with the galleys. "I want you to read this and rip it apart, he said. Try to find every flaw you can. I want to know every fallacy it may contain!" He was forever grateful to that boy as well! His love for the Ribbono Shel Olam manifested itself in His creation and in His People. He once asked Rav Isaac Sher, how to grow in Ahavas Yisrael. Rav Isaac told him to pick a Jew and do for him what ever you can. He picked a Yid in Slabodka and constantly helped the man. Even after the man’s passing, Rav Miller would give tzedoko l’illuy nishmas that man and even publish in his memory. He was a tremendous Ba’al tzedoko. Discreetly, he distributed tens of thousands of dollars of tzedoka to Yerushalmi families who were b'nai Torah. Rav Miller had his life calculated to the minute. Though he shared in the joy of every simcha-- from brissim to bar mitzvos to weddings-- it was difficult for him to attend. The traveling and participation would disrupt his demanding schedule of learning, teaching and writing. In the 40 years he served as a Rav, with hundreds of congregants and thousands of Talmidim, he was only mesader kiddushin an average of once a year. When he was sitting shiva, he continued saying shiurim. He felt that it was tzorchai rabim and could not be foregone. Rabbi Miller was quiet. Three years later, he met the Talmid again. After greeting him warmly, he told him. A Talmid, an elderly bochur who ate by Rabbi Miller almost every Shabbos, became a chasson. He very much wanted to share the simcha with his rebbe, but did not want to impose upon him to come to the wedding. The young man gladly accepted the tie and wore it to the wedding. Rav Miller, never left his home. He hardly ever, perhaps never, went on vacations or visited relatives, for no specific reason. He always excused himself saying, “I’m sorry but I have a very big examination coming up in the near future.” Of course he was referring to the Yom HaDin. He talked about Issurin shel Ahava, and would explain, that at the time you might think it Issurin, but later you will see that it is Ahava. As the illness became more serious, so did his resolve. A few months back, however, his devoted grandson, Yisroel, who had helped administer medical treatments, was tragically killed in a car accident in Eretz Yisrael. Soon after, things began to deteriorate. He gave his last shiur over Pesach, but by then the raging fire of Torah and mussar began to diminish. On early Friday morning, Klal Yisrael lost one of its last lions, as Rav Avigdor Miller, the teacher of thousands, returned his Neshama tehorah to the place where he would be ultimately rewarded on his final bechina. Rav Miller leaves behind his wife, Ettil, who tended to his every need, structuring her entire life around his ever-constant harbotzas Torah. He is also survived by his son Eliezer; his daughter Shaynee, who is married to Rav Shmuel Elchonon Brog; his son Shmuel, Rosh Yeshivas Bais Yisrael; a daughter Libby, who is married to Rav Yeruchom Lashinsky, Maggid shiur in the Mirrer Yeshiva in New York; and a daughter Devorah, who is married to Rav Hershel Kanarik Maggid shiur at Yeshivas Ohr HaMeir in Peekskill. In addition, Rav Miller left behind a legacy of Torah; more than 6000 tapes of shiurim, twelve seforim (five of which are on the Chamishah Chumshai Torah), three on history, three on hashkafah and one on tefillah. These are in addition to the seforim that many Talmidim have published based on his thoughts. Rav Eliyahu Brog, a grandson of the Niftar and the Memalei Makom of his grandfather in kehillas Bais Yisrael. a son of the Niftar and Rosh Yeshivas Bais Yisrael in New York; a son-in law, Rav ?? and Rav Shmuel Yaakov Bernshtein, Rosh Yeshivas Chevron Geulah; Rav Meir Zvi Bergman, Rosh Yeshivas Rashbi; Rav Mattisyahu Solomon, Mashgiach Beth Medrash Govoha, Lakewood. The kevurah was made in the chelkas harabbanim on Har Hazeisim. May the zchus of his Torah and hashpaah be a mailitz yosher on his family and Klal Yisrael.